I’ve already told you about my toothache woes in a prior “Stronger Than I Look” post. And while you should remember all details of each and every post I’ve ever written, here’s the synopsis: a dentist broke a needle in my mouth when I was very young and then the same dentist extracted my impacted wisdom teeth many years later without putting me under to which I hyperventilated myself into a “snorting” oblivion. End result: I’m supersize scared of needles, especially anywhere near my mouth. And I snort when I’m terribly upset. So, why does the toothache have its own holiday? Who on earth would celebrate a toothache? I wasn’t sure so I had to do some research. Some say this holiday coincides with the day that the Hershey Corporation was founded, which was February 9, 1894. Others think that it’s a celebration of the Feast of St Apollonia, which is also February 9th. But then again, she is a SAINT. She wouldn’t own a personality disorder like sarcasm. I couldn’t find a picture of her smiling. So, I have a broken toe. I busted it yesterday when I accidentally kicked a suitcase that was laying in the middle of the floor. It’s my middle toe – or the “piggy who ate roast beef” – and it appears that I’ve broken it at the top joint. It hurts, but at least it’s a pretty purple color. I tried to insert a picture here, but technology has failed me at this point in time. 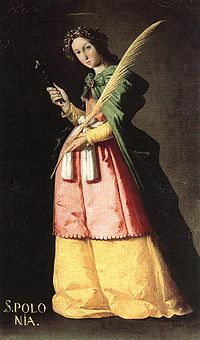 Having this broken toe and then learning that the toothache has its very own patron saint made me curious if there was a patron saint of broken toes. There’s not. The closest saint would be St Drogo, who is the patron saint of broken bones. He is also in charge of shepherds, coffee houses, hernias, mentally ill people, and unattractive people. Sort of a “catch-all” of patron saints I guess. And yet, all Apollonia got was the toothache. She WAS robbed. So, this is what I do with myself while my son sits through an infusion of chemo. My brain goes a million miles a minute and I catch what I can to pass it on to my loyal readers. I have to tell you, I am NOT in charge of my brain. It does its own thing and I keep up with it as best as I can. Some would call me mentally ill, but at least that still qualifies me to fall under St Drogo. I know he’s got my broken toe and my defective brain, I just hope he’s got my back. Being the good Catholic I am, I looked up the Patron Saint for Feb. 9th on the night prior to having a c-section to deliver Terry. It was your Appolonia, the toothache gal. She’s also the patron saint of dentists, I was literally ESTATIC when all this came together!! I cheerfully called my perplexed friends and family with the good news and then went out to the Catholic store and got a pile of her Saint trading cards to put in his birth announcements. And you think YOU are mentally ill?!?!?! love ya!